Hey guys. I have a question for you. I know that I get the most response to my posts about baked goodies, such as upside down plum cake, carrot cake or New York style cheesecake. And baking is what I enjoy the most. But I also want to write about modern Russian cuisine, with ingredients and processes that are adapted to the US (and international!) audience. I've written about such basics as borsch, eggplant caviar, okroshka, vinegret and yellow pea soup. So my question is: is there anything specific you would like me to write about? A dish you have tasted, an ingredient you have heard about, perhaps I could answer some general questions about what Russians eat? Let me know; it's a lot more fun to talk about something that I know others are interested in. Anyway... I've been struggling with the name for these "pickles." 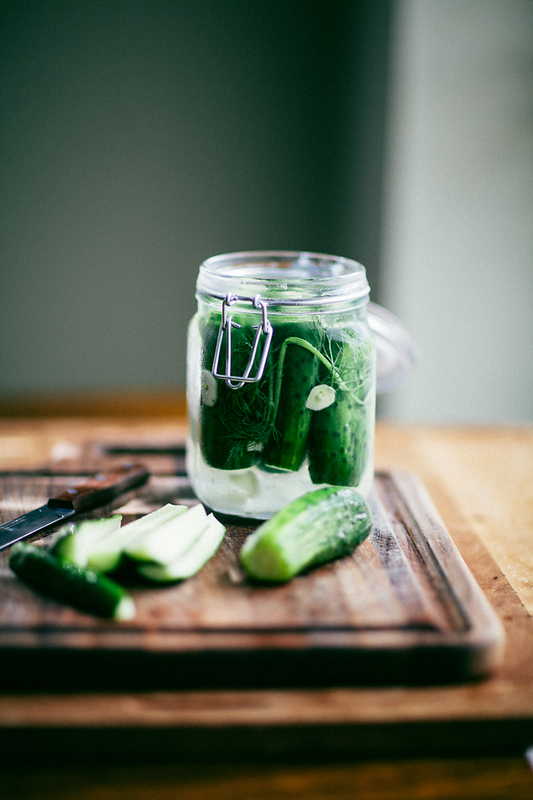 Because strictly speaking, the cucumbers are not pickled: no acid is used in their preparation. They are brined in a salt-water solution for 24 hours, resulting in mildly salty but crunchy "pickles," without the acidic harshness. This is actually a popular way to cure cucumbers in Russia, especially in the summer, when tiny, fuzzy cucumbers are available in open-air markets and people's backyard or "dacha" (summer home) vegetable gardens. The favorite way to eat them is with "young" (new) potatoes which are boiled in their paper-thin skins and served with generous amounts of butter, dill and, sometimes, sour cream. 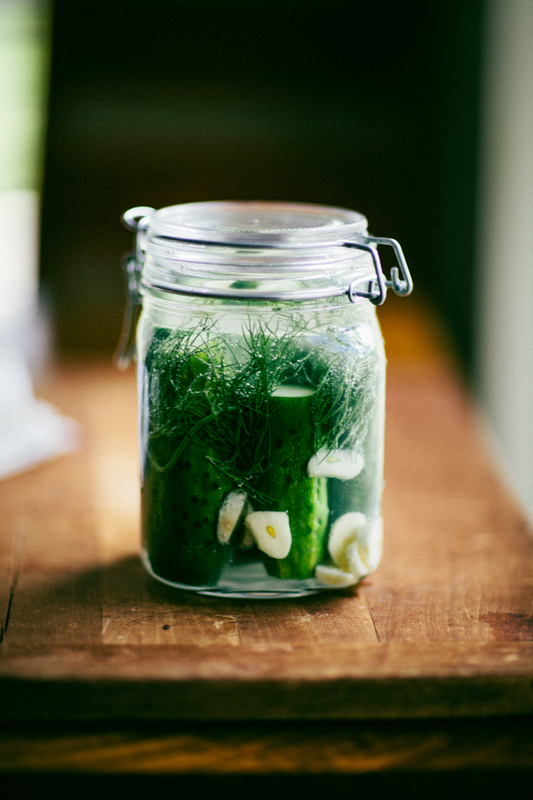 This recipe calls for carbonated (sparkling) water whose tiny bubbles make the pickles especially crunchy. I should credit Russian celebrity blogger Nika Belotserkovskaya for the idea. After trying it, my long quest for the malosolnye ogurtsy was over. A word about the cucumbers: if at all possible, try to use the smallest ones you can find. Those ginormous thick-skinned wax-covered generously-seeded monsters you see in supermarkets will not work. I was few times in Belarus when I was small. I know Russia and Poland got many similarities in cuisine so I will be happy with any recipes or maybe bread recipes, for fish some traditional cakes. What you eat on Christmas ?. Maybe some photos from your part of Russia? Salo!! Of course! It's been years since I've had cured pork fat. Wouldn't mind some now... just a little though ;). Thank you for the ideas on what to write about. I live in Texas now but visited Russia last winter. I should post some photos from that trip. Thanks for the inspiration! So easy that there's no excuse not to make these at home. Most often I see them called "half-sour pickles," though I've also heard "fresh pickles" and like that name better. Do you use kosher salt or table salt in your recipe? What is the advantage of one over the other? Kosher salt is less salty, right? I'm wondering whether it makes a difference in the flavor or texture, assuming you adjust the amount for level of saltiness. Hi Andra. "Fresh pickles" sounds good; I think it conveys the idea well. "Sour" makes me think that the pickles went bad somehow. Kosher salt is definitely less salty and is probably used for the kosher dill pickles? In this recipe I use regular table salt. It is finer in texture and dissolves quicker, which is important because you don't want to have to stir the brine so much that the gas bubbles disappear. Thanks for the offer; I'd love to know more about Russian cuisine! I recently made black bread according to Smitten Kitchen's recipe, and I am delighted with the results! However, a bonafide Russian friend tells me the recipe might not be quite 'authentic', and adding coffee and chocolate is perhaps a modern/US addition. At any rate, I'd love to know more about Russian bread making! I've noticed that the Smitten Kitchen blogger writes sometimes that she offers Russian recipes. I think her mother-in-law is Russian? Chocolate and coffee in your black bread sounds suspicious :). I am not a bread connoisseur, but I think black bread is black because it is made entirely from rye flour and not because of other additives. Personally, I am not a fan of rye bread: it seems too sour and strong-tasting. But if the bread you baked is tasty that's all that counts! Also, really really excited to try this "pickle" recipe. :) Thank you for posting it. I really am not sure what makes that bread "Russian" - I've found the recipe on Smitten Kitchen's blog and there was no evidence of its "Russian-ness" (other than the fact that she calls us "Russkies" and implies that we drink vodka before going to work :)). Your malosolnye ogurtsy look so delicious that we regret summer and the cucumber season has been over... We done some too (http://mrmrssandman.blogspot.com/2012/07/najlepsze-ogorki-maosolne-i-najmilsze.html) - they disappeared in a split second. Your pickles look so good, complete with grape leaves! Too bad I can't read Polish. Nice job! Oh wow, cool. I didn't know! Thanks. I love fresh crunchy pickles as opposed the the mushy heavy vinegary ones. A lot of your recipes remind me of growing up in my Romanian/German household. 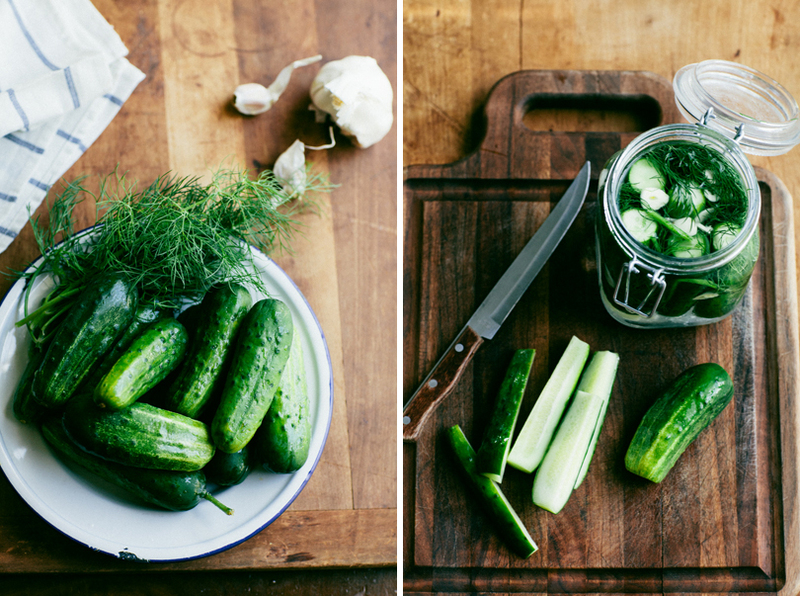 I will try these pickles this weekend. I will probably add some mustard seeds, but otherwise, will follow it. Hi Cornelia! Hope you'll like them :). These look delicious!!!!! Im curious though wow long do they stay good for? Could I make them and then keep them in my pantry for a few weeks or do they have to be refrigerated right away? They do not keep at all. They are good for about 3 days max, and they need to be kept in the refrigerator the whole time. How long do these keep? Do you have to store them in the refrigerator? Yes, refrigerator, and only up to 3 days. After that they become too salty. I've been making these since I first saw your post. They taste exactly as my Czech grandmother used to make them. I use 7 Kirby's and 2 tablespoons of kosher salt and they last one week without becoming too salty. Very delicious.